School Social Media: Are You Talking to an Empty Room? But what’s a school social media page manager to do with a brand new page? Settings just right? Check. Awesome cover and profile pictures that represent the school brand perfectly? Check. About Us sections that tell your story just the way you want it? Check. But, wait—no one seems to be around to see it! Everything looks perfect, except for that dreaded counter on your Facebook page reading “2 Likes.” And you know that’s just you and your co-page manager. So now what? Be sure to display your social media buttons prominently on your school website. Don’t bury them at the bottom of your page; place them in the banner at the top of every page so your site visitors can easily follow the link to your Facebook, Twitter, etc. Embed your Twitter or Facebook feed on your website. Every time you post to your social profile, it will appear on your website, too! Use your website’s News page to get the word out. As soon as you set up your social pages and are ready to start posting to them, add an engaging story to your website that tells site visitors how excited you are to connect with them and invites them to follow you there. Each social platform allows you the opportunity to create a personalized URL for your school’s profile. This makes your location on the web easier to remember and share. For instance, our Facebook page is located at www.facebook.com/SchoolWebmasters. Seems obvious right? Well, it’s a lot easier to remember than the bunch of random numbers and letters Facebook will assign to your page if you don’t personalize your page’s address, that’s for sure! Share the web address and links to your social pages on school publications like newsletters and flyers. 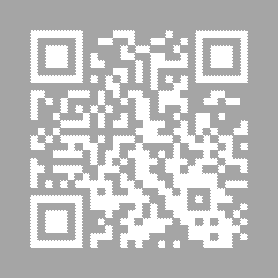 For print materials, you can also try something fun and convert those web addresses to QR Codes so would-be followers can scan the code from their smartphones and go straight to your page. Yours will look slightly different. When a follower with a QR reader app on their smartphone scans it from a poster or flyer, they will be taken directly to your social page. When you first create a new social page, every platform will give you the option to follow other profiles. An important part of being visible in the world of social media is interacting with other relevant pages (like educational organizations, other schools, and local businesses) by following, liking, sharing, and commenting on their posts. You’re there to be social, so BE social! Building community broadens your reach when it comes to spreading your school’s brand. Attracting reciprocal likes and follows to your own social page (I’ll follow you if you follow me!) also helps spread your brand and broaden your reach. Building up your Home feed helps you stay more connected with how other organizations in your area are using social media. When School Webmasters builds a social page for a school and hands it off to them to manage, we always get them started by following/liking at least 10 other profiles. If you’ve read this far, we know you’re really invested in making your school’s social media presence as effective as possible, so we’re going to share the inside scoop with you. We invite you to download a free list of some of our favorite educational organizations. Find them, follow/like them, and you’ll reap the rewards of some really great education-related content your whole community can use. Is your school having a slow news day and you’re at a loss for what to post? Just check your Home feed; if you follow our advice and follow these organizations, you’ll find some shareable content in no time. These organizations are great for general education content, but don’t ignore your local community when you’re building up your social media connections. Use the search bar in each platform to find local pages relevant to your school. Follow your local state education department, other elementary/high schools in the area, local universities, business/community partners, etc. Remember, in partnership with your school website, the goal of your social pages is to communicate with your current families, market to new ones, and build real-world relationships with your surrounding community in general. Social media campaigns are a great way to both build your following and keep your existing followers actively engaged with your posts. A successful social media campaign requires you have at least some audience members (100 or so followers should do it), but you can also use your school website and other publications like newsletters and print materials to help promote your campaign if your number of page followers is still lacking after employing the methods above. For new social pages just trying to gain followers, your campaign should focus on offering some kind of prize in return for likes, follows, shares, etc. 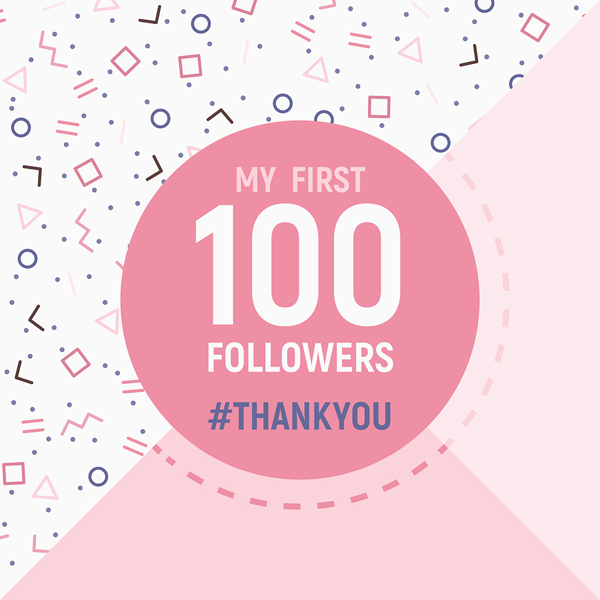 Your first social media campaign can be as simple as announcing a drawing for everyone who likes your page within a given time period (announce it from your social pages and your website). All you have to do is record the names of the people who follow you within the allotted time, put the names in a hat, and select a winner! Student/Family Facebook Cover Photo: Invite families to take a creative picture that communicates how much they love your school. When they submit their photos, let it spend a week serving as your school’s cover photo. Photo/Video Contest: Invite families to submit a photo or video of a favorite holiday tradition and choose a favorite to win. Like to Enter: Post a photo of your staff enjoying their winter break, and invite followers to like it over a certain period of time. Enter those names in a drawing, and offer a prize to the winner. Share to Enter: Post a marketing video of your school, and invite followers to share it with their friends over a certain period of time, entering those who do into a raffle. Once you’ve built up a healthy social media following, remember to take steps to help ensure your posts are actually showing up on your followers’ News feed. On Facebook, this means you should be teaching your followers to “See First.” Facebook’s newest algorithm favors posts from personal profiles over ones from business pages, which means your school posts may end up getting lost on your followers’ home feed, or worse, not at all. One of the signals Facebook will be looking for to determine where to place your page’s posts will be page engagement. This means you must focus on audience-centered content, which you should be doing on all your social media pages, but it’s especially important on Facebook. First, though, take advantage of what is probably the best work-around when it comes to dealing with the new algorithm governing your page’s ranking on your followers’ news feeds. Choosing to “See First” is almost like bookmarking your school page, as it puts each new post at the top of the news feed. 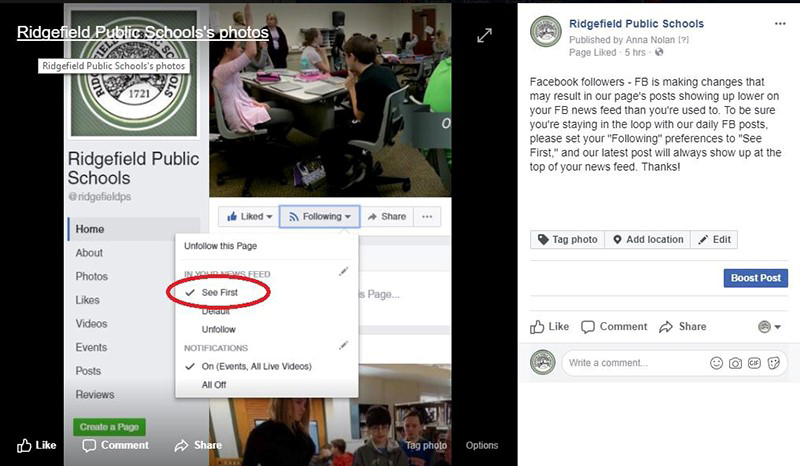 Ridgefield Public Schools posted an invitation to their followers to use this feature along with a screenshot that shows them how. With your posts getting preferred treatment on your followers’ Facebook feeds, you can continue to stay in front of your audience by posting audience-centered, school-specific content that will generate likes, comments, and shares. The more people who see your posts, the more engagement you’ll have, and the more your audience will grow. Once you’ve done the important work of building a social media audience, following best practices will help ensure you actually keep your followers, which is, of course, key. We’ve set up many school social pages only to help build an audience, hand them off, check on them a month later, and find that no one has been posting to them. You don’t want to build a beautiful social media presence only to find out you’re speaking to an empty room. Likewise, and maybe even more importantly, you don’t want to fill that room with people and then have nothing to tell them. You see, social media for schools is about building and connecting with your community. Your audience will like or follow your pages because they want to know what’s going on in a more meaningful way than a newsletter or website article can communicate—they want to feel connected. Building your audience is one thing, but maintaining a connection with your social media followers through effective page management is another. Thankfully, we can help with that! From page management services where our social media professionals post to your school pages for you, to our one-of-a-kind online training for do-it-yourself school social media managers, Social4Schools Academy, School Webmasters is all about giving school personnel the tools they need to meet their online communication goals. Contact us today to find out how we can help.